NEG Scratch Resistant Glass vs Gorilla Glass - How Good is it? Home » Mobiles » NEG Scratch Resistant Glass vs Gorilla Glass – How Good is it? NEG Scratch Resistant Glass vs Gorilla Glass – How Good is it? Gorilla Glass and Dragontrail Glass are the two widely used and most popular scratch resistant and protection glasses used in Smartphones, Tablets and other mobile devices. If you have been following my blog regularly then you must have known that previously have written many articles on Gorilla Glass and Dragontrail Glass. Also I have compared them both closely and also listed down the phones that have them. If you are a new visitor to my blog or have not read those articles then you can find those articles or resources below. What is Gorilla Glass & Why it is so Tough? What is Dragontrail Glass and which Smartphones use it? But here I am going to discuss another Scratch Resistant Glass for mobile devices which is NEG Glass. 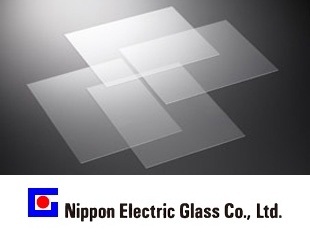 NEG or Nippon Electric Glass is a glass from Nippon Electric Glass Co., Ltd. which is a Japanese glass manufacturer and produces various types and kinds of glasses that includes Glass for Display Devices, Glass Fiber, Glass for Electronic Devices, Building Materials, Heat-Resistant Glass, and More. The company is not new as it was established 1949 but it suddenly came to limelight among various users on internet because of the use of their new scratch resistant and damage resistant glass in smartphones. You can know more about the NEG company by visiting their official website here. 1 What is NEG Glass [Dinorex] for Smartphones & Mobile Devices? What is NEG Glass [Dinorex] for Smartphones & Mobile Devices? NEG or Nippon Electric Glass for mobile devices is a very hard, high tensile strength and scratch resistant glass that is used as a protection glass in smartphones, tablets and may be other mobile devices. Just like Gorilla Glass and Dragontrail Glass, NEG glass is also very hard and flexible which prevents scratches and damage due to minor drops and rough handling. The special name or the brand name of NEG’s Scratch Resistant Glass for Smartphone, Tablets and other Mobile devices is Dinorex. NEG chose the name Dinorex, a portmanteau meaning kinsg of dinosaurs, based on the image of the Tyrannosauraus Rex, known to be the strongest of Dinosaurs. The name indicates the strength and toughness of the glass against cracks and scratches. NEG’s Dinorex is made hard and strong using chemical strengthening. 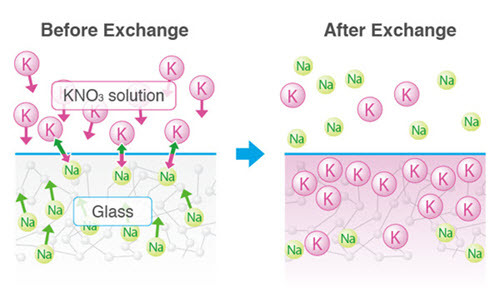 This process for strengthening is known as Ion exchange mechanism where glass containing sodium ions (Na+) is soaked in a potassium nitrate solution containing potassium ions (K+), the Na+ ions on the glass surface change places with the K+ ions in the solution. The resulting K+ ions have a larger diameter than the Na+ ions and exert compressive stress on the glass surface. The glass thus produced can also withstand a hammer blow without breaking. Dinorex T2X-1 – It is a very tough and hard glass that is scratch resistant and shock resistant. It can withstand damages and stress much better than the conventional soda lime glass. Its strength is similar to that of gorilla glass and dragontrail glass. Dinorex T2X-0 – It is a glass that has touch sensors integrated in it. This means it is a One Glass Solution or OGS Glass just like Corning’s Concore Glass. NEG glass is used in Coolpad Note 3, Coolpad Note 3 Lite, Meizu m2 note, Meizu m3 note Android Smartphones. We can expect to see more smartphones and tablets using this glass in future. NEG glass may not be as good as Gorilla glass and dragontrail glass but it is certainly better than ordinary soda lime glass. There is not much technical detail available about the new Scratch resistant glass from NEG used in mobile phones, but there are good and positive reviews about this new glass. So if your new smartphone does not have Gorilla Glass or Dragontrail Glass protection but has NEG Glass protection then you don’t have to worry about it as your smartphone screen will be as safe as it would have been with the other two. Iam going to buy coolpad note 3 lite.but many are saying that its glass will broke easily than gorilla and dragontrail.Is it true.Which is the best glass among this. Coolpad Note 3 Lite has NEG Dinorex Scratch Resistant glass which is fairly strong but not as strong as Gorilla Glass. I HAVE PURCHASE GIONEE P7 MAX SO ITS HAVE NEG GLASS OR NOT OR HOW MUCH STRONG IT IS ? I does come with NEG glass and is quite strong for resisting scratches. Hey have you bought the cell how is it? I haven’t bought it but trust me it is an amazing phone. Thank you so much.Honor 8 has NEG so I was worried and was starting to have second thoughts on buying it. Which glass protection does huawei honor 6x have? and if it is’nt gorilla glass, it is as good as gorilla glass? Nothing is specified for it but i think it should be having NEG glass protection and it is as good as gorilla glass if not better. With all due respect, I beg to differ. I purchased an Honor 6x at the beginning of February, and the screen glass cracked horizontally from a very small amount of compression ( phone was under a decorative couch pillow and my 7 lb dog jumped on top of pillow). The screen did not shatter per se, but it was in fact ruined, the crack went all the way thru and I had to return the phone and buy another; this should not be able to happen logically, therefore there is inherent weakness present in the material itself, regardless of what the specs claim. I also notice there is no oleo-whatever added to this material of screen glass, and it shows fingerprint oils and smudges like crazy from even the most sanitary clean hands and normal usage. The chemical treatment they omitted to add to the screen glass which helps preclude fingerprints and so forth, is very inexpensive so I cannot fathom why they opted not to utilize it. After 3 Honor 6x phones, I am now leaning toward the Honor 8 or the ZTE Axon 7. One can always add a tempered glass screen protector to help prevent so many awful fingerprints and smudges, but it doesn’t minimize or offset the true state of the glass screen material, which is much more fragile than specs or ads indicate. Thanks Gina for sharing your experience. While in *theory* the NEG glass is – per your conclusion – as good or better than Gorilla glass, is it really? If you’ll see this YouTube user – https://www.youtube.com/user/JerryRigEverything – they do scratch tests on various phones and those with the NEG glass (ie Honor 6X) fail when it comes to the scratch test as compared to phones with the Gorilla glass. I won’t say it is better than Gorilla Glass but it is good for resisting small scratches. It is better than normal glass. True, you didn’t say, but you did write: “It is said that NEG glass is as good as Gorilla glass and dragontrail glass if not better.” … If not better. I’m not trying to criticize your article here and you provide a valuable service to many searching out phones. I’m just trying to help those who might see that and latch on to the “it’s as good or better” when some testing by others have shown it to be just the opposite … not as good. Of course this isn’t a constant as each company will continue to develop and upgrade their technology, so we don’t know what the future might hold. Anyway, thanks for your analysis and investigation into all of this, it takes a particular mind to be able to comb through all the details and present them in an understandable way for others. Well they might have the bad batch of NEG glass but who knows as nowadays you can hear stories about gorilla glass 4 breaking easily. But as per the latest horrors of NEG glass i am editing this line. Thanks for taking your time out and commenting on my blog. yes it has Gorilla Glass 3 and i think it is one of the few huawei phones to have gorilla glass protection. NEG Glass is not as strong as gorilla glass. I have two Meizu M3 Note. Guess what? Both fell down from a meter high (though a month apart), and cracked instantly. Dinorex is not as good as Gorilla or Dragontrail, it is way bad. I am looking at a lot of scratch resistant glasses in the market. I wanted to confirm whether the market for these products can be quantified and can they be the product for the future. What type of glass does the Huawei ascend XT2 or the elate, ( The same phone) have? I actually recently bought the stylo 4 which has NEG protection, yet it isn’t totally scratch resistant as I have recently discovered a light scratch on the screen. It’s not noticeable unless under sunlight or another bright light source. So when these companies claim ‘scratch resistant’, that’s not always accurate. Thanks. Gorilla glass is best. I have used many phone with gorilla glass and i am happy with gorilla glass. I will always purchase phone with gorilla glass protection. NEG is just okay but gorilla glass is better.